This article outlines how to turn an inward facing organization outwards. It is meant for companies that seek significant growth rather than those in a pitched battle with established competitors in mature markets. The larger an organization becomes and the longer it lives, the more likely it is to become inward facing. As people, we live our lives constantly fighting against the forces of gravity as we age. Keeping an organization facing outward requires the same tenacity for three reasons. First, people can define, take action and control what’s happening inside much easier than what’s going on outside. Second, when times are good it suggests that what’s happening outside can take care of itself. Last, when times are bad, controlling cost is much easier than increasing revenue. It’s all about control. The problem is that most hard wired controls are vastly over-rated if not illusionary and the softer ones are just that…soft. Norms, values and good communication aren’t quick to grab, manipulate or change. When startups reach the size where growth pressures demand “we’ve got to get organized” what was an energetic, social system evolves into a more formal structure with functions, business groups, job levels, etc. It’s not that some of this isn’t needed. It’s that once you start organizing, it never seems to stop. It’s the organization demon seed taking root. Silently, the organization pivots inward. Evidence used for making decisions shifts from interaction with the outside world to respectable surrogates. Purchased market research grows as direct contact with current and potential customers declines. Staff functions appear and start exercising control. The organic startup mentality that dynamically sensed and responded to issues morphs into a mechanical apparatus that sets its own rhythm as it silently erodes initiative. People start managing the firm rather than the business. To see how one turns an inward facing organization back out, let’s understand the forces at play. 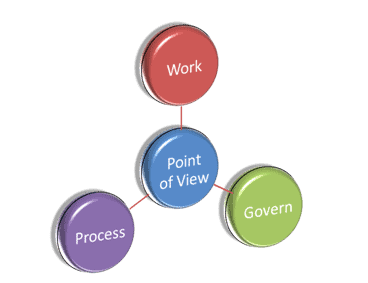 An organization has four basic elements: the work that needs to be done, the process it uses to do it, how it’s governed and its unique character or point-of view. Externally the firm’s point of view differentiates it from others. Internally, the firm’s point of view incorporates the firm’s vision, values and core competencies. Most vision and values statements define the firm’s aspirations and code of conduct focused internally. Similarly, outward facing companies make engaging external resources and partners part of their values. They paint a more expansive picture of citizenship responsibilities that includes sourcing expertise wherever it lies. Analysis Group Economics, a leading consultancy that provides economic analysis to support litigation, partners with academic affiliates from major universities. Their leaders make it clear that the affiliate relationship and experience is as important as the customers. The next item to re-orient is the combination of work and work process. Outwardly facing firms take deliberate actions to make it easier for the outside world to work with them. Just as marketers are always testing “are we easy to do business with?” outwardly facing firms strive to make collaborating in the work flow easy for outsiders. For example, using modular design methodologies makes it much easier to parse work between parties, inside and out. This requires investing in standard parts, defined interfaces and having strong systems engineering capabilities. There changes alter how one invests, staffs and differentiates a firm. Investing in standard parts implies that competitive advantage has to come either through uniquely combining those parts, adding something proprietary to them or perhaps through support and service. It also requires hiring more people with systems architecture capabilities who can lead integration and fewer line engineers. Last, marketing and product/service development have to work closely to create a differentiated offering that delivers superior customer experience while using standard parts. Outward facing firms also extend individual accountability. The people in inward facing firms focus primarily on their deliverables whereas outward facing workers focus on their deliverable and share accountability for critical interfaces and handoffs. Outward facing leaders know that engaging outsiders increases diversity that can lead to misunderstandings. They address this by being much more careful to test communications frequently and use short cycle check-ins to detect and correct errors quickly. Politics, pride and position quickly sabotages work of any kind yet for outward facing firms, it’s particularly poisonous. They strive to keep everyone focused on the task, make assignments based on the best competency match and advocate transparency in data sharing and decisions. This sounds simple but it’s not. We all hate to make errors and detest even more sharing our errors in public. Yet that’s exactly what’s required to earn the trust of customers, partners and suppliers. Good leaders use “error confessions” as an opportunity to underscore this behavior by rewarding those who come forward. Last, outwardly facing organizations shift the weighting of experienced resources from the center to the edge. Customers and suppliers will quickly sniff out where the power resides in a firm. If the edges do not have the capabilities and accountability to act on behalf of the firm, all claims to being outwardly focused ring hollow. This also means that while strategy and alignment may be owned by the center, the input and deliberations that define it include leaders at the edge. Turning an inwardly focused organization outward does not happen through rhetoric. It requires deliberately altering the key elements of organization such that they work from the outside in. Since you’re constantly fighting gravity, the way to build momentum is to embed as much as possible in your firms point of view and then push it out to the edges of your work, process and governance. We’re a gaggle of volunteers and starting a brand new scheme in our community. Your web site provided us with helpful info to work on. You have done an impressive activity and our entire community can be thankful to you.